Did you forget activate your computer within 30 days of installing and it is now stuck in reduced functionality Mode? Are you not yet ready to activate your copy and want to extend the activation period another 30 days or for longer? Using a slick Internet Explorer trick you can break out of Reduced Functionality mode and run the commands required to reset your activation period and recover use of your computer. It starts when you log in and shown this error screen instead of taken to your desktop. Your only options are to activate now or enter reduced functionality mode. In reduced functionality mode, you will only have access to internet explorer, so that you can buy a license for Windows Vista! 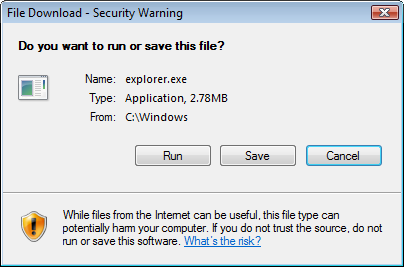 Since Microsoft has still given us access to Internet Explorer, we can use it to launch the default explorer process. We will then use the explorer interface to open an administrative level command prompt to run the activation rearm command which will recover from reduced functionality mode. On the Activate Windows Now screen shown above, click Access your computer with reduced functionality. One Internet Explorer loads, hit the Alt key to bring up the menu bar. Click on File and then select Open. On the open dialog, type in c:\windows\explorer.exe and hit OK.
You will now see the first of many open confirmations that IE will prompt you with. Hit OK on the first. Click Run on this prompt. Finally, hit Run yet again. Explorer will now start and you will see your taskbar and desktop. 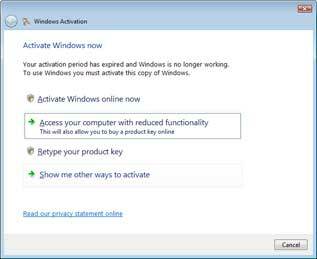 You can now follow the normal procedure or extending the activation period as shown here.